Dancing With Ashley: Let the Holiday Season begin!!! One of my neighbors has been working on his Christmas decorations (outside in the 100 degree heat) for the past week. My other neighbor has a "Welcome to our Patch" sign on her front door with pumpkins surrounding it. My neighborhood is ready. We aren't playing around this year. I do have a serious issue with Halloween decorations, though. Tombstones and lots of unnecessary spiderwebs kinda freak me out. I have softened over the years, mainly because the boys think it's awesome that our neighbor has a huge,inflatable Halloween Scooby Doo in his yard every year. Here are some of the things I am really digging for Halloween. How adorable are these witch hat cupcakes??!!! Source. Links to the Subway Art here. A few cutie printables, some festive candlesticks, and you are SET! Sparkly Pumpkins? Now THIS is something I can get in to. 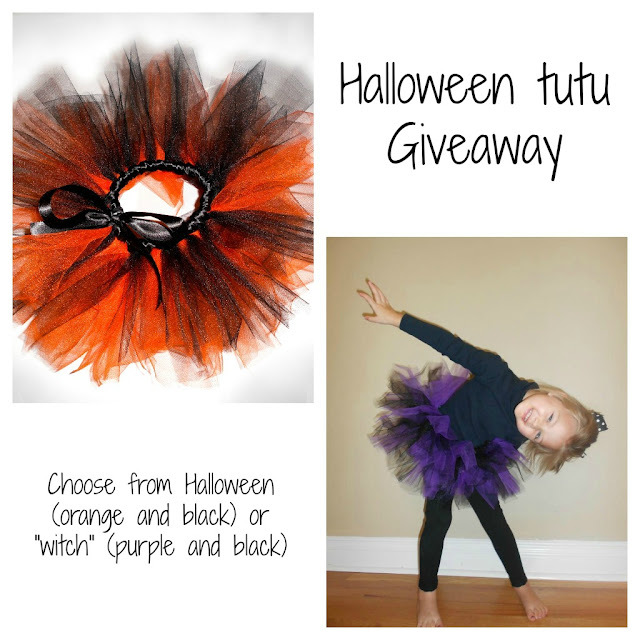 Lucky for us, Meredith from Kutie Kidz is giving away a Halloween tutu to one lucky reader. And if you win, you have a choice of orange/black or purple/black (for a "witch"..how cute!) She will custom make it for whatever size you need. The first 2 entries are mandatory and the rest are optional for more chances to win! The winner will be announced next Monday! And until next Tuesday (Sept 11), Meredith is offering free shipping on her Halloween tutus. (Just mention that this post). We are definitely trying those sparkle pumpkins, my daughter will love it! I love the tutus!!! If I had a girl I would def have a million tutus!! You are getting me so excited for upcoming holidays. I love those bling-y pumpkins. So cool! i lovee love the holidays!! getting out of the heat! being able to layer!!! and all the glitter and sparkly outfits you can muster hehe! omgosh those witch cupcakes are SOOO adorable!! I love to decorate more for Halloween than Christmas. Is that bad? It's just fun and a lot less time consuming! ;) Your picks are so cute...especially the mantle and bedazzled pumpkins!! Love those decorations! I'm a big fan of decorating for Halloween, Thanksgiving, and Christmas. This time of year is so fun! I love that mantle! I'm so ready for fall! Those tutus are so adorable! Great pics! 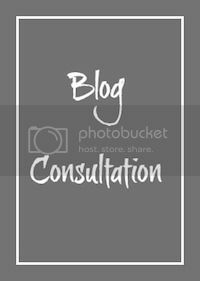 Would you like to follow each other? oh gosh, you are getting me SO excited for all the fun holidays! 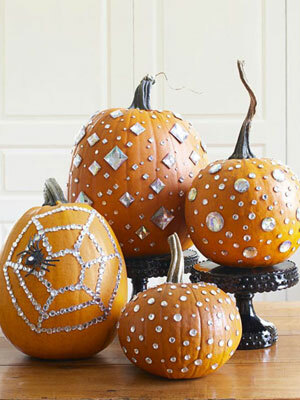 and i love these bejeweled pumpkins! what a great idea! totally doing this for the holidays! 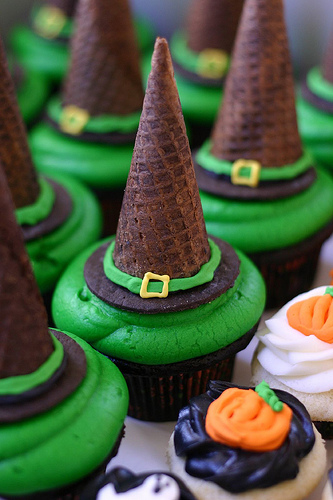 Those witch hat cupcakes are so adorable! Some of my neighbors already have Halloween/fall decorations up too. I guess summer is officially over. 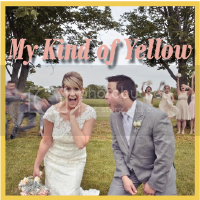 omg this is precious! if i have a daughter someday, she WILL have a tutu! Christmas already!??!?!? SERIOUSLY? And do you think that tutu would fit me? Oh those are some WICKED cupcakes! And I love the bejeweled pumpkins! How cool?! I LOVE tutus! I have been on a tutu making spree lately. Mostly for my girls American Girl dolls, but I am already gearing up for Halloween costume tutus! Ahhh the best time of the year! I can't wait to start decorating.... those witches are SO CUTE! Ahhh local plumber of the year! I can't delay to begin designing.... those wizards are SO CUTE!